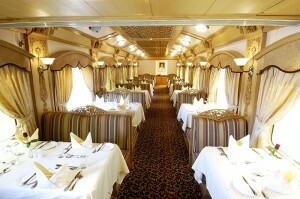 Travelling on the luxury train is truly a royal journey. I can say it after experiencing such journey when my cousin planned to go by a luxury train. We both were confused to choose suitable luxury train so we browsed the web. After a lot of net surfing, we came across with several options of luxury trains like Palace on Wheels, Maharaja Express, The Golden Chariot, Deccan Odyssey and Royal Rajasthan on Wheels. We decided to board Deccan Odyssey from Mumbai. To our surprise, the tariff and schedule of the train both were quite suitable for us. On our arrival at the Mumbai airport, the representative welcomed us and escorted us to hotel where we got freshen up. Flagging off from Mumbai, this luxury train stops at Ratnagiri to give you an opportunity to visit Jaigad fort and Ganapatiphule beach. In the evening, we went to the Chhatrapati Shivaji Terminus Railway Station from where our tour started. While enjoying dinner, we reached Sindhudurg. Next day, we had breakfast on board and we were taken for a visit to the Ocean Fort. Built by Shivaji, the fort covers an area of around 48 acres. Admiring the beauty of architecture of the fort, we returned and then headed towards Tarkarli beach. Rest of the time, we spent at leisure on the same beach. After relishing our lunch, we proceeded to Dhamapur village by bus to visit the Cashew factory. We also visited ancient temple of Goddess Bhagawati and Bharadi Devi situated on the banks of a lovely lake. On our third day, we were in a beautiful beach destination of Goa. The tour took us to the ruins of St. Augustine Church, the largest Cathedral in Goa. The Basilica of Bom Jesus and The Cathedral and the Church of St. Francis of Assisi, an archaeological museum for Goan antiques. In the evening, we were enjoying at Goa Beaches. We savored the traditional cuisines at Goa beach hotel and returned. Next day, which was our 5th day on board, the magnificent train took us to Daulatabad station. After having breakfast, we embarked on a journey in an AC coach to the fort of Daulatabad, located 600 ft above the Deccan plain. Ekkira Caves was our next destination, which enabled us to visit the 34 caves of the Ellora. The caves are adorned with sculptures of three famous religions- Hinduism, Jainism and Buddhism. Post lunch, we went to explore the Bibi-ka-Maqbara and shopping in the markets of Aurangabad. 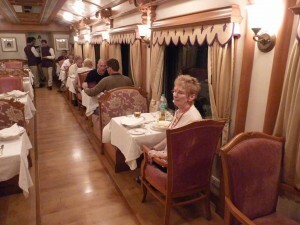 We enjoyed our dinner on board and slept with the memories of the enjoyable day we spent. Our 6th day passed in visiting the Tadoba Wildlife Sanctuary, where we saw the royal Bengal tiger and Sambar, Nilgai, Wild dog, Chinkara, Pangolin, Gaur, Leopard cat, Spotted deer, Sloth bear, Chausinga, Panther, Hyena, Indian bison, Jackals and Barking deer. After enjoying a jungle safari at park, we were back. We had our lunch on board and in the afternoon we headed towards Sevagram. I was too excited to visit the place that has been witnessed of A Gandhian way of life. We got a wonderful opportunity to explore the Gandhi’s Ashram in Sevagram, Prayer Ground, Gandhiji’s Secretariat, Akhari Niwas and Gandhiji’s Exhibits. Our second last day, the 7th day was in Ajanta and Nashik. After having a scrumptious breakfast, we arrived at the World Heritage Site of Ajanta Caves. We spent some time to explore the marvelous caves here. After lunch, we reached Nashik and visited Panchwati Ghat by bus. Our group of travellers was walking around the ghat and then, we visited Kalaram Temple. In the evening, we had a Farewell dinner on-board, which was an unforgettable experience. Not only you can visit some fabulous places of India, but you can also enjoy various cultural programmes inside the train itself. The tour came to an end and we could not believe it. Soon, we arrived at CST Mumbai and left for our home. I must stay that Deccan Odyssey is the perfect way to experience the royalty with its warm hospitality and modern amenities. 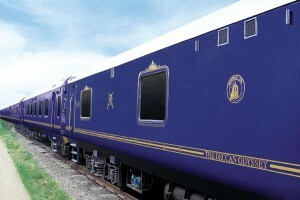 Royal Rajasthan on Wheels – Rekindle the Charm of Luxury! Meet India – Golf’s Own Country! !